You want to make an impact, delivering talks and presentations that make a difference, whether to your bottom line, your career or a cause you support. I work with you to build your confidence and show you that you can be a great speaker, just as you are. I give you the tools, frameworks and skills to grow your business and succeed in the workplace, earning more money, respect and peace of mind. I have a variety of coaching courses and programs so choose what works best for you. 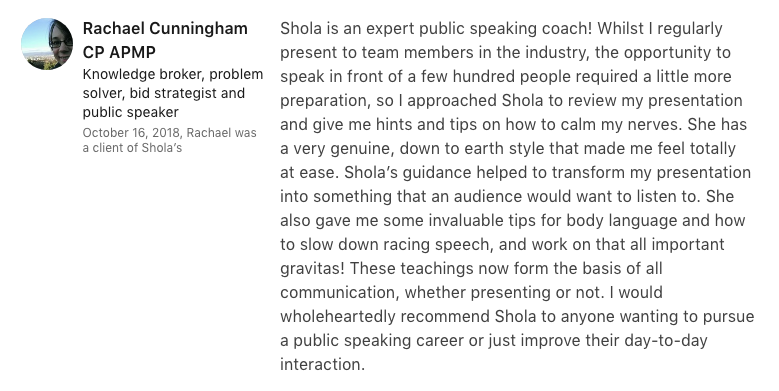 With 15 years spent on stages, two books on communications, teaching and coaching qualifications and a public speaking award, I can help you make an impact and stand out in front of your chosen audience! Getting that big presentation prepared and rehearsed – the one you’ve been putting off for ages! If you’d like to make some real headway, book a half-day or full-day VIP session. We can create your signature talk, develop a system for finding speaking opportunities and program the software that will help you, build a full-blown strategy for dealing with work meetings and presentations, and so much more.